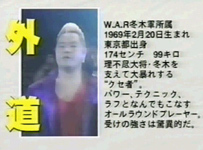 This event was originally reviewed on February 13th, 2004 and was my first ever wrestling show review, and also the first full puroresu show I had ever watched. 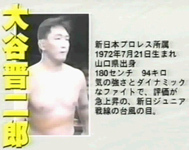 When I originally reviewed it, I had seen some puroresu matches but it was my first full show and I didn't know who 75% of the wrestlers were. Looking back on it, I didn't think it was a bad review, but I could tell it was before I had my style down as it was a little rough around the edges. 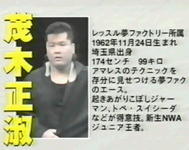 Also it was clear my puroresu knowledge was limited even though I had done a fair amount of research. So I am completely re-writing it, after all these years, and while my general opinion of the matches didn't change I hope it will be a little more refined this time around. Single elimination, Pegasus and Liger get first round byes for being so damn awesome. Let's get the tournament started! Onward to the Quarter Finals! Post Match: Liger helps Naniwa up, shakes his hand, and does a little crab sign with his hands as the crowd roars its appreciation for both wrestlers. 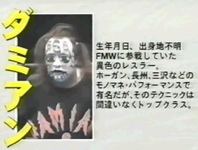 Liger leaves first and Naniwa eventually follows after bowing to the crowd as they chant his name. Jericho and Pegasus circle each other to start, tie-up, arm drag by Pegasus and both men are back on their feet. Tie-up again, this time Jericho with an arm drag as he yells to Pegasus "Come on, mother fucker!" 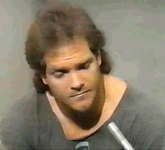 Hammerlock by Pegasus but Jericho gets to the ropes, and the two trade slaps. Reverse chinlock by Pegasus and he drives his knee into Jericho's back. Jericho reverses positions with him but Pegasus returns to his feet. Tie-up, Pegasus pushes Jericho to the mat but Jericho gets out of it and hits a sunset flip. Pegasus regains the advantage but gets up, also allowing Jericho to return to his feet. Delayed vertical suplex by Jericho, cover, but it gets a two count. Chinlock by Jericho, scoop slam, he goes out to the apron and delivers a slingshot splash for a two count. 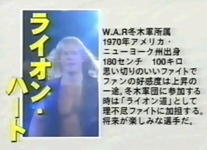 Jericho applies a chinlock to Pegasus, Pegasus gets back to his feet and hits a backdrop suplex to get out of it. Pegasus picks up Jericho and delivers a snap suplex, cover, but it gets a two count. Irish whip by Pegasus and he nails a lariat, cover, but again it gets two. Pegasus picks up Jericho and hits a backbreaker, and then stretches Jericho over his knee. Pegasus applies the Lion Tamer to Jericho (before Jericho used it no doubt), but releases it after a moment. Irish whip by Pegasus, but Jericho holds onto the ropes to avoids the dropkick and hits a senton. Cover, but it gets a two count. Jericho picks up Pegasus, Irish whip, and Jericho delivers a lariat. 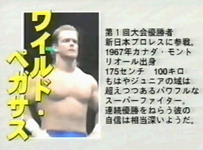 Jericho picks up Pegasus, Irish whip to the corner and Jericho hits a dropkick. Chops by Jericho to the chest but Pegasus lariats Jericho back into the corner. Irish whip by Pegasus, Jericho rebounds out of the corner with a quebrada but Pegasus moves out of the way. Knee to the stomach by Pegasus and he drops Jericho stomach-first onto the top rope. Jericho drops down to the apron, punches by Pegasus and he suplexes Jericho back into the ring, but Jericho lands on his feet. The jockey for position to start, Irish whip by Otani but Ultimo Dragon shoulderblocks him down. Irish whip again by Otani but Ultimo Dragon flips out of the backdrop suplex and kicks Otani out of the ring. 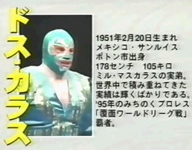 Ultimo Dragon goes for a pescado onto Otani but Otani moves out of the way. Missile dropkick by Otani from the apron while Ultimo Dragon is on the floor, Otani rolls back into the ring and delivers a springboard plancha. Otani throws Ultimo Dragon out of the ring, and Otani nails a swan dive kneel kick to the back of Ultimo Dragon's head. Scoop slam by Otani, he goes up to the turnbuckles but Ultimo Dragon hits a dropkick off the side ropes to send Otani to the floor. Asai Moonsault by Ultimo Dragon and he rolls Otani back into the ring. Irish whip by Ultimo Dragon and he delivers a lariat, cover, but it gets a two count. Headscissors by Ultimo Dragon but Otani gets out of it and applies a crossface hold. They trade positions as they grapple on the mat, Otani goes for the cross armbreaker but Ultimo Dragon blocks it and applies a knee lock. Otani regains the advantage, Irish whip by Otani and he hits a dropkick for a two count. 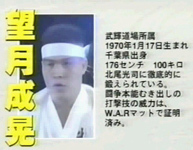 Snapmare by Otani and he applies a reverse chinlock. Otani goes for the crossface chickenwing but can't get it locked in, he manages to lock in a cross armbreaker but Ultimo Dragon gets out of it and kicks Otani in the back. Kick to the chest by Ultimo Dragon and he goes for the leg again, but Otani takes him down and applies a heel hook. Ultimo Dragon makes it to the ropes and both wrestlers return to their feet, stomps by Ultimo Dragon, Irish whip from the corner and Ultimo Dragon delivers a lariat. Camel Clutch by Ultimo Dragon, but after a moment he releases the hold. 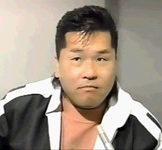 Ultimo Dragon goes for a suplex by Otani reverses it into a suplex of his own for a two count. Back kick by Otani, he picks up Ultimo Dragon and nails a tombstone piledriver. Ultimo Dragon pops up however and hits a tombstone piledriver of his own, but Otani absorbs the blow and hits a second tombstone piledriver. Ultimo Dragon returns to his feet and hits his second tombstone piledriver, but Otani is back up. Test of Strength to start the match, Liger pushes Ultimo Dragon to the mat but Ultimo Dragon gets back up, spinning headscissors by Liger but Ultimo Dragon gets out of it and applies a side headlock. Liger in turn gets out of that and applies a stretch hold, but Ultimo Dragon kicks out of it and both men are back to their feet. 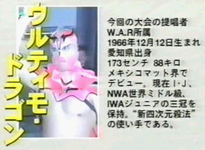 Takedown by Ultimo Dragon and he applies a knee lock, but Liger reverses it into wrist lock. Back up, takedown by Liger and he applies a headscissors, but Ultimo Dragon quickly flips out of it and they return to their feet. Takedown by Liger and he applies a stretch hold, Ultimo Dragon returns to this feet, Irish whip by Ultimo Dragon and he delivers a spinning backbreaker. Irish whip again, reversed by Liger and this time he hits the spinning backbreaker. Back to the headscissors by Liger and he applies a stretch hold, but Ultimo Dragon gets back to his feet. They trade slaps, Irish whip by Ultimo Dragon and he goes for the Octopus Hold but Liger gets out of it and applies a side headlock. Back up, Irish whip by Liger but Ultimo Dragon rolls out of the back bodydrop attempt. Ultimo Dragon goes off the ropes, they trade moves but neither can get an advantage and they face off again in the middle of the ring. Irish whip by Liger and he dropkicks Ultimo Dragon in the knee. 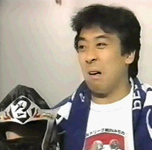 Another dropkick to the knee by Liger, he goes off the ropes and dropkicks him a third time. Liger hits a release German suplex and applies a figure four leg lock. Bow and arrow hold by Liger, but Ultimo Dragon gets out of it and applies a single leg crab hold. 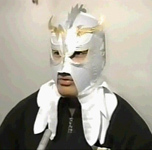 Ultimo Dragon reverts that to a Muta Lock, he lets go of the hold and throws Liger into the corner. Irish whip by Ultimo Dragon and he delivers a cartwheel elbow strike. Fisherman Suplex by Ultimo Dragon but Liger breaks out of it, but Liger quickly applies a figure four leg lock. Liger makes it to the ropes, they go off the ropes but Ultimo Dragon knocks Liger out of the ring. 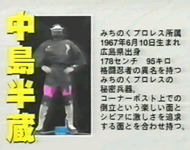 The next match is a non-tournament match to give Gedo a breather before the final. Psicosis VS Rey Misterio Jr. They circle each other to start, tie-up, drop toehold by Psicosis and they jockey for position on the mat. Hammerlock by Psicosis but Misterio gets out of it and applies a leg lock. Irish whip by Psicosis, reversed, and Misterio delivers a spinning backbreaker. Another spinning backbreaker by Misterio, he applies an arm wringer but Psicosis reverses it. Irish whip by Psicosis to the corner and he hits a jumping kick. Arm wringer by Psicosis and he applies a hammerlock, but Misterio snapmares out of it. Psicosis goes off the ropes but Misterio kicks him in the legs. Body scissors into a bulldog by Misterio, he goes off the ropes and hurricanranas Psicosis over the top rope to the floor. Misterio then gets a running start in the ring, jumps off the side ropes and nails Psicosis with a somersault seated senton. Back in the ring, Psicosis goes off the ropes and he dropkicks Misterio in the leg. Irish whip by Psicosis but Misterio grabs the ropes, then Misterio does a cartwheel, lands on Psicosis's shoulders and delivers a Misteriorana. Psicosis back bodydrops Misterio out onto the apron and joins him, they trade kicks, but Misterio catapults Psicosis into the ring post and he falls to the floor. Misterio then goes up to the top turnbuckle and sails out onto Psicosis with a hurricanrana. Psicosis manages to get back in the ring with Misterio following, Psicosis tries to suplex Misterio back in the ring but he lands on his feet. Misterio goes off the ropes but Psicosis hits a spinning heel kick, sending Misterio out of the ring. Psicosis then goes off the far ropes and jumps out onto Misterio with a tope suicida. Psicosis rolls back into the ring as Misterio gets onto the apron, and Misterio delivers a swan dive dropkick to the back of the head. This sends Psicosis out of the ring, and Misterio goes to the ropes and delivers a swan dive somersault seated senton. Psicosis gets back in the ring, Misterio goes to the apron and nails a swan dive hurricanrana for a two count. Psicosis goes off the ropes but Misterio kicks him in the leg as he runs by. Crossbody by Misterio to send Psicosis out of the ring, and then Misterio hits an Asai Moonsault to the floor. They get back in the ring, Misterio goes off the ropes but Psicosis catches him with a powerslam. Powerbomb by Psicosis, he goes up to the top turnbuckle and nails the guillotine leg drop. Cover, but it gets a two count. Psicosis hits another powerbomb, he goes to the top turnbuckle again but Misterio rolls out of the way of the corkscrew moonsault. Heel kick by Misterio, and he kicks Psicosis onto the top turnbuckle. Misterio joins him but Psicosis pushes him off when he goes for a Frankensteiner. Misterio quickly recovers and jumps back up to hit one anyway, another hurricanrana by Misterio and he picks up the three count! Your winner: Rey Misterio Jr.
Best Match: Which Liger match to choose... 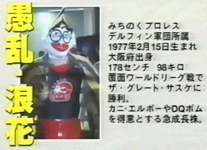 I'll go with Jushin Liger vs. Gran Naniwa. 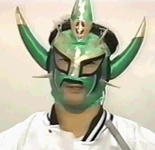 Liger/Ultimo Dragon was technically slightly better, but in his match with Naniwa, Liger both put on a great match and brought someone else up with him. 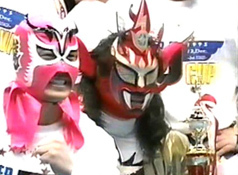 Ultimo Dragon didn't need any help getting to Liger's level, but for Liger to convince the crowd that Naniwa was his equal made it quite the spectacle. 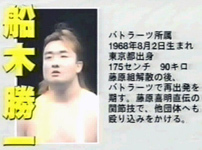 One of the best matches of Naniwa's career. 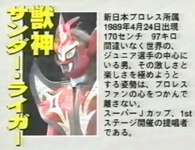 MVP: Jushin Thunder Liger. Often times in tournament matches another wrestler can shine more so then the winner of the tournament. 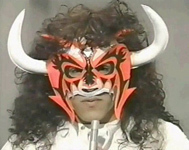 Not in this case, Liger had the best matches and also made his opponents look as good as possible in the process. He was the best in the tournament and he won the tournament, can't knock him for that. 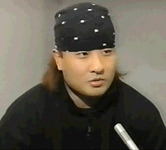 Gedo would be the MVP as he probably had the most "growth," but his matches were too sub par to be the MVP. 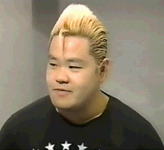 Overall: While not at the level of the 1994 version, you still had some of the best Jr. Heavyweights in Japan present in this tournament. I miss old school one day tournaments, it was a real test for the wrestlers to keep the crowd into it and also a test to their stamina and conditioning. 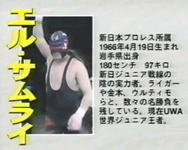 The 1995 version of Gedo didn't help overall, I know it is the common complaint about this tournament but there is a good reason, he wasn't a bad wrestler but with a line-up like this tournament having him be the only one with four matches was going to effect the overall quality. Still a great tournament, and highly recommended.